"I want you because you're kind, generous, and playful. I want you because when it snows, you say the stars are falling. Because you choose joy over bitterness. I want you because you choose to believe in things you can't see. Because you choose to dream." Hello guys, it's me, Julia, and I'm back with another review. This is a special one, because this is the conclusion of one of my favorite fantasy series, and also one of the most underrated gems when it comes to books (in my humble opinion!). I discovered the Foolish Kingdoms series by Natalia Jaster at the beginning of last year because of some fanart I saw darting around my Tumblr dashboard. I decided to pick it up because as we all know I love me some good romance + fantasy combination. However, this series took me by complete surprise. So much so, that it flew to the top of my favorite fantasy book pile and made me vow to read everything Natalia Jaster has written. More than a year down the line, I can now say I have absolutely devoured each and every one of Natalia's books, the Foolish Kingdoms books especially. For those of you who have never heard of the Foolish Kingdoms series, let me explain in short what these books are about. "You're a whisper," he said. "A tender soul. May I call you that?" So, the Foolish kingdoms are set in a world where there are four kingdoms; winter, spring, summer and autumn. Every book takes place in a different kingdom (Dream is set in winter as the cover suggests, Dare in Summer, so on) and features characters from different lands. The first book, Trick, introduces Poet, a court jester, and the princess of Autumn, Briar. The books each follow a separate love-story, but include cameos of different characters from previous books in the series. Foolish kingdoms deal heavily with ableism but is set in a fantasy setting, which is unlike anything I have seen in the YA fantasy genre. Now, then, to get specific, Dream, in particular, centers around Nicu, the son of Poet and Briar (yes, the protagonists of Trick! ), who is deemed a "fool" for his unconventional way of speaking and thinking as well as his inability to come to terms with the concept of spaces. However, Nicu meets a roguish boy called Lyrik, and the both of them clash. The tropes this book can be categorized under are second chance romance, and a little bit of hate-to-love (which is what Natalia is known for!). "If you open your mouth, you can swallow the stars." What did I think of Dream? 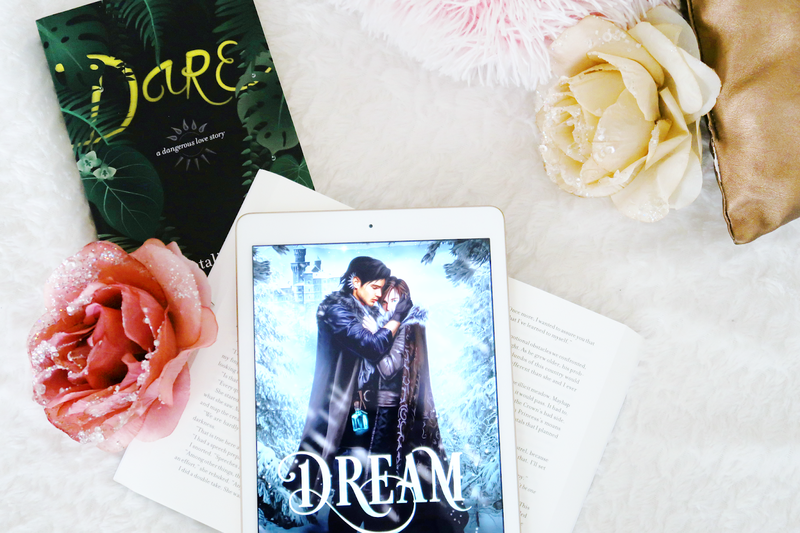 First of all, let me just reiterate that Dream is such a special book to me, (the whole series is, c'mon...), but Dream and Trick in particular are my favorite ones. Poet and Briar are my favorite couple of the series, and the both of them have such a heart-warming relationship with Nicu. From the first book on, I've fallen in love with the three of them, so, to see them return (as a family!) had me overjoyed and in mental shambles. Now, for the writing of Dream, Natalia has such a unique and whimsical way of writing, which fits within the theme of the books. I think her writing style and word-choice is GORGEOUS. The book is filled with metaphors and Natalia manages to create a beautiful poetic atmosphere. A nice thing to note is the difference in the way both Nicu and Lyrik's POV's are narrated. Whereas Lyrik has a first person narration and is a lot more direct, Nicu speaks in third person and uses very whimsical language. I loved this added touch to the novel, and it highlights the stark difference in character between the two! To come back to the romance plot in the book. I thought this was amazingly done. I was curious to see how the two of them would work after their debacle in Lie, but I adored them together. Lyrik's rogue exterior but his soft attitude towards Nicu made me so giddy, I love dynamics like that. And, yes, I know I keep saying I love Nicu, but I LOVE NICU SO MUCH. Their relationship had such a supportive nature, so nice to see this happen in a genre like this. As a character, Nicu owns my whole heart. I absolutely love this boy. His unique way of talking and thinking was such a unique experience to read. I loved how Natalia gave him an animal sidekick in this book, once again, which added to the fairy-tale like atmosphere of the series. Also, I loved the cameos of previous characters in this book. All of the previous protagonists in the series came to say hello and banded together to give the story closure. I loved reading how all of them ended up post-book. I just love them all a lot, okay? I love how Natalia handles the theme of disabilities and ableism within her books. When I first read Trick, I felt so overcome with how unique and intricately crafted the story was. For Natalia to keep giving me this feeling book after book is such a feat as an author. Each and every book in this series was a treasure I will keep close to my heart. I love this whole universe and I can't believe it's over now. Each and every one of these books provided a magical feeling and had me engaged and moved like not many books have done before. All of the characters, Poet, Briar, Jeryn, Flare, Aspen, Aire, Nicu and Lyrik brought their own uniqueness to this large story and I can't wait to see what Natalia writes next. If you haven't read the Foolish Kingdoms series yet, please do so because it truly is such a wholesome experience. This whole series deserves a solid five stars.